CTI's offers an unmatched reputation for reliability and support for the OEM sub-assemblies. The molded silicone models are rugged and features tactile response, gold contacts and are available in standard or custom designs such as international keyboards (e.g. Spanish keyboard (QWERTY), German keyboard (QWERTZ), French keyboard (AZERTY), Portuguese keyboard (QWERTY), UK English keyboard(QWERTY), Italian keyboard (QWERTY )and other languages upon request). 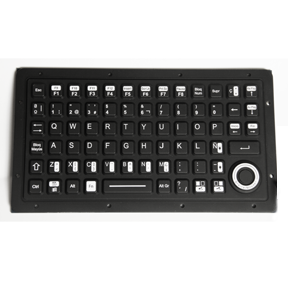 These ruggedized keyboards are ergonomic and can be easily be fitted with our line of Industrial Mouse™ pointers (e.g. Serial, PS/2, USB). They are one of the robust and durable waterproof keyboards available for applications in rugged and critical industrial environments. 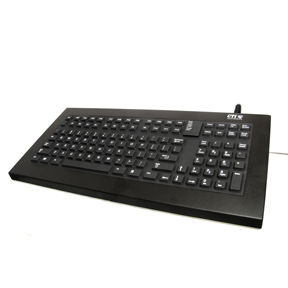 These OEM keyboards are available with or without CTI's high reliability OrbitalMouse® or ArrowMouse™ mouse pointers. If you are interested in full travel mechanical keys or molded silicone, we design and manufacture our entire industrial keyboards; assuring fast delivery to meet your schedule. CTI manufactures an OEM sub-assembly for special applications that require a drop in panel and are mounted into a stainless steel bezel plate. Our panel mounted industrial keyboards offer the same unmatched reputation for reliability and support as CTI's standard rugged keyboards. These ruggedized keyboards provide you highest level of accuracy and are a reliable solution for various demanding applications in multifarious industry sectors. Our panel mounted industrial keyboards are in a NEMA 4 (IP66) sealing, molded silicone model feature tactile response and gold contact. They are available in two standard designs; or can be customized (e.g. French keyboards, Spanish Keyboards, German Keyboards). These industrial computer keyboards are integrated with our line of rugged, drift-free Industrial Mouse™ pointing devices pointing devices. CTI designs and builds the most reliable, rugged, sealed NEMA 4/4X (IP66) and NEMA 12 (IP54) industrial keyboards that can be used in wet or harsh environments which may cause damage to other keyboards, and can also be used for critical applications. These waterproof keyboards can withstand the rigors of dirty, dusty and corrosion prone industrial environments. 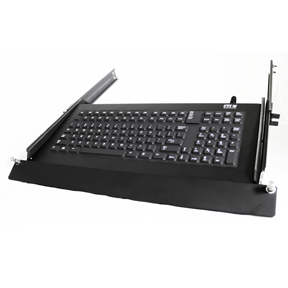 These ergonomic industrial keyboards are protected in a welded, gasket sealed aluminum or stainless steel enclosure and have molded silicone keys with excellent tactile response and gold contacts. These sealed industrial keyboards can be designed with CTI's drift-free industrial pointers Industrial Mouse™, OrbitalMouse®, or ArrowMouse™. These rugged Plug-n-Play keyboards are the ideal choice when it comes to industrial computer keyboards. CTI's unique patented design for our line of industrial rackmount keyboards features a folding door that provides the used with an ergonomic hand rest for the comfort of the user. 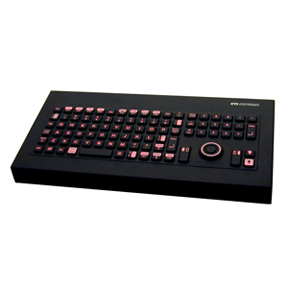 These sealed, ergonomic keyboards are packaged in painted, welded metal enclosures with sliding rails rated at 80 lbs. per side and fit in 1U standard rack heights. They are the industry-known ruggedized keyboards that are resistant to liquids, oils, synthetics, hazardous chemicals, biological materials, and allows for cleaning with germicides and chemical sterilizing agents. The unique and rugged CTI's rackmount keyboards are extensively used for demanding military operations. These military keyboards provide a good tactile feedback when typing, as well as a high functional reliability. 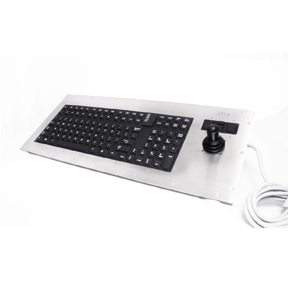 CTI's industrial rackmount keyboards are available with or without our highly reliable and drift-free industrial trackballs, industrial trackballs, Industrial Mouse™, OrbitalMouse®, ArrowMouse™ mouse pointers. CTI's illuminated keyboards are used in environments with low-level lighting and would demand illumination. CTI's illuminated keyboards have 10 levels of illumination which allows the users to adjust the brightness to fit their needs. 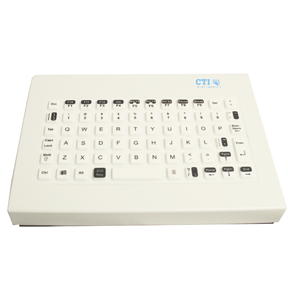 CTI's illuminated keyboards are available in OEM sub-assemblies or desktop keyboards, and can be fitted with either green or red LED backlighting. They are intelligently designed and precision made for use in mission-critical military operations. These backlit military keyboards can be equipped with CTI's rugged, drift-free trackball mouse, ArrowMouse™ or OrbitalMouse® pointing devices or with just the keyboard. Our illuminated keyboards have the same support and unmatched reputation for reliability and support as all of our products. These backlit industrial keyboards are a perfect solution for the military, medical and aerospace applications. We designed and built our line of medical keyboards with the utmost concern for their reliability in the field. CTI's line of sealed, rugged NEMA 4 (IP66) industrial keyboards are the most reliable and are for used in medical applications or harsh, wet environments. Our medical keyboards come equipped with a white silicone boot and white enclosure which allows the user to easily spot any contaminants on the keyboard. They are the industry-best waterproof keyboards available for use in hygiene-critical medical and health care environments. Also these rugged keyboards are highly resistant to many different liquids and contaminants. These industrial medical keyboards have molded silicone keys with excellent tactile response and gold contacts, which truly makes them the world's best industrial keyboard.